Sponge Gourd or Nenua (in Hindi) is one vegetable I missed a lot when in Hyderabad. This simple nenua ki sabzi is very easy to make and is one of my favorites. Even a 15-year-old can make it. When I say two-ingredient Nenua ki sabzi recipe, that means the main ingredients are just onions and nenua or sponge gourd. The other ingredients are green chillies, salt and oil from you Kitchen shelf. That’s it. I have never made this vegetable in pressure cooker and won’t suggest you also, as I think this would lead to a tasteless veggie. That’s my assumption; if you want to try, go ahead! Add oil in a Kadhai and heat. 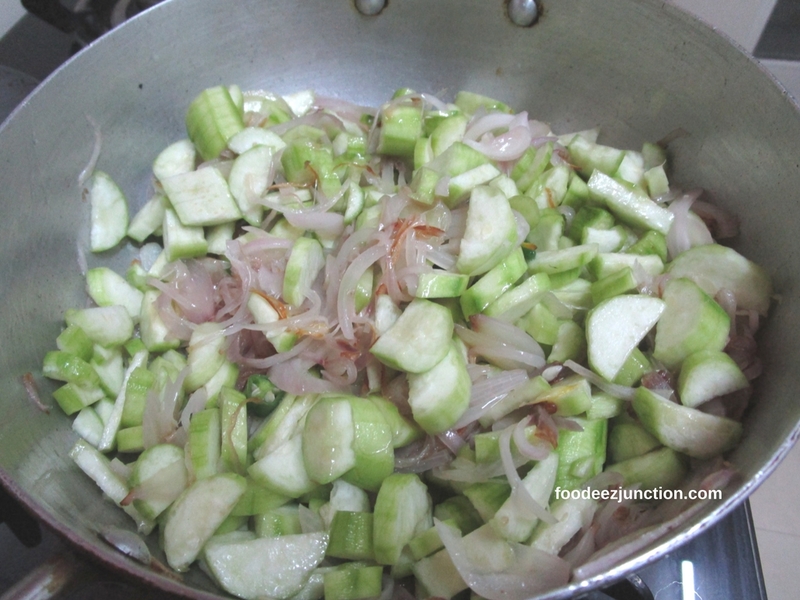 Add sliced onions and saute till they turn soft and pinkish. Add green chillies, nenua and salt. Stir the veggies and cover the lid. Let it cook on low flame. 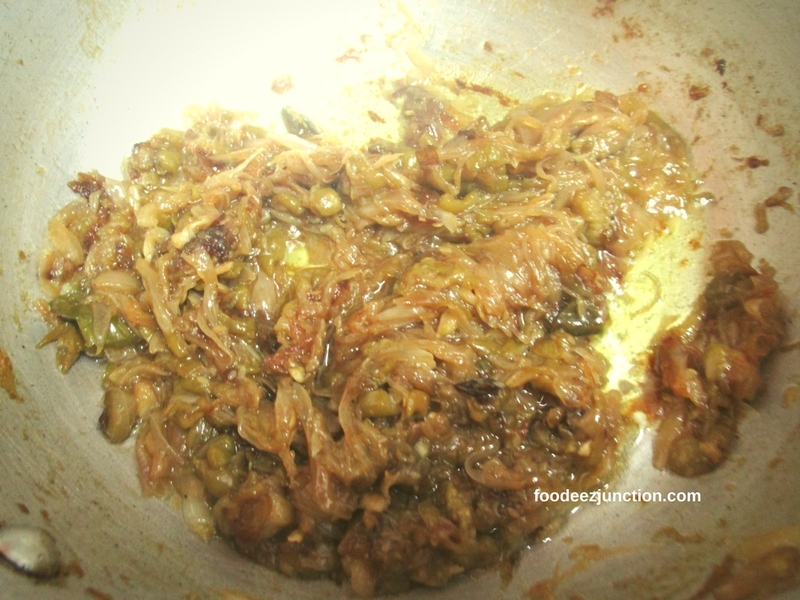 Stir after every 5 minutes for next 20-30 minutes or till the sabzi leaves the fat. Open the lid and fry for another 10 minutes. Switch off the flame. Serve with rice or Tur Dal and Rice. Peel all Nenua or sponge gourds, cut them into equal halves vertically. Now, chop each halve into thick horizontal pieces (not too thick). Repeat for all and you are done with cutting and chopping the spongegourd for nenua ki sabzi. Heat oil in a kadhai or a wok. Once the oil is hot, add sliced onions. Saute till they turn soft and pinkish. Now add green chillies, chopped nenua and salt. You might feel that kadhai is getting full. Need not worry, once the sponge gourd turns soft, it starts to release water and lessens in quantity. Cover the wok with a lid. And let the veggie cook on low flame. After, every 5 minutes, stir nenue ki sabzi; repeat for 20-30 minutes or till the sabzi starts leaving the fat. Once the oil starts separating, open the lid and let it fry on low flame. Keep stirring and do not let the sabzi stick to the bottom of the pan. Stir fry for 10 more minutes and switch off the flame. Take out the Nenue ki Sabzi in a serving bowl and have it with Tur or Arhar Dal and Rice. My favorite is just nenue ki sabzi and rice with mango pickle. Yumm! If you are serving nenue ki sabzi only with rice, then this recipe will be just for 2-3 people. Once the Nenua Sabzi is cooked, switch off the flame and tilt it to 70 degree angle to get rid of excess oil. If you cooked this nenue ki sabzi at home, please share the pic with us and let us know too or simply tag us #foodeezjunction on Facebook, Twitter or Instagram (scroll down). We will be very happy to know. Also, we would appreciate, if you spare just two minutes to fill this query. This is just to make Foodeez Junction better.